Since the late 1990s Bangladesh has been witnessing a large scale of militant and terrorist activities and attacks throughout the country. But in recent times, the pattern of these militant and terrorist activities drastically changed revealing a suspicion of having close ties with the global terrorist and militant organizations like ISIS or Al-Qaeda. Subsequently, the militants often targeted and killed a number of bloggers, atheists, non-Muslim preachers and priests since 2013 and the level of such incidents is increasing alarmingly. These incidents took place on the heels of the Global Terrorism Index’s (GTI, 2015) assessment that the country is ‘vulnerable to high terrorism risk’. The GTI score of the country was already on the rise from an historic low of 4.1 in 2012 to 5.47 in 2013 to 5.92 in 2014. However, this trend and recent increase need to be contextualized within the historical developments of militancy in the country and counter-terrorism efforts pursued since 2006. As Harrison (2006) in his article, A New Hub of Terrorism? In Bangladesh, an Islamic Movement with Al-Qaeda Ties is on the Rise published in The Washington Post, argued that the strategically located nation of Bangladesh is going to be a new regional hub for terrorist operations after analyzing some case studies of killing and bombing by several militant organizations like JMB, JMJB, HuJI-B and others. Also the recent killings of the Rajshahi University professor AFM Rezaul Karim Siddiquee on 23 April and the killing of Xulhaz Mannan, a gay rights activist, and his friend Mahbub Rabbi Tonoy in the capital Dhaka on 26 April 2016 are showing the growing strength of Islamist militancy in Bangladesh revealing the truth of several security and terrorism analysts’ comments on the Bangladeshi militants’ close links with the global jihadists. 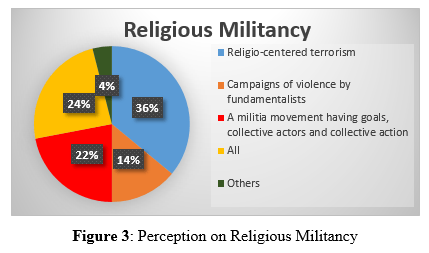 On the basis of primary data, the study examines the growing nature, historical development, causes, consequences, impact, socio-political dimensions, and security challenges of the religious militancy in Bangladesh along with the role of state level institutional arrangements and their limitations in order to combat militancy and terrorism in Bangladesh. The central argument of the study is that Bangladesh is facing a growing intensity of religious militancy revealing close ties with the global jihadists where banned religious parties and groups are responsible for the recent attacks and killings of the bloggers, atheists, university teachers and non-Muslim priests due to their feeling of alienation from the liberal democratic system; political, economic, social and cultural suppression over the fundamentalists; their goal of establishing own religious ideology within the political system; the weak presence of the main political opposition (BNP) in political affairs; and the limitations of several counter terrorism mechanisms to combat militant activities properly. Militants engage to secure supports in society and reassert some control over their lives to minimize anomic feelings by providing outlets to manage their stress and encountering exclusionary states. When resources are available, unorganized but aggrieved groups may make it possible to launch an organized demand for change, giving rise to a consistent movement for: 1) Material and organizational resources, 2) Legitimacy and identity resources, 3) Institutional resources (Hafez, 2003: 19). Local militias combine of a motivated leadership and a militia ideology. Transnational militias support its branches through networks. Two type militia organizations may emerge:1) Above-ground: leading movement openly within a hierarchical fashion;2) Below-ground/underground: operating movements within secret militias organized in a cell structure (Barkun, 1996: 50-64). Freilich et al. (2001) mention two forms of ritual in this regard: Form 1– a symbolic display of militarism in public meetings; form 2– paramilitary exercise such as training, boot camp, and practice shooting. Islamist militant groups in Bangladesh which emerged in the 1990s have undergone several transformations. Originally grown out of the volunteers who joined the Afghan war against the Soviet Union, these groups have since then taken different shapes. Since the 1990s, five ‘generations’ of militant groups appeared on the scene. In some measures, the militant groups have come full circle: they began as a result of a global agenda fighting an ‘atheist’ Communist system (war against the Soviet Union in Afghanistan) to now being part of establishing a global ‘khilafat’ (by joining the IS in Syria and Iraq) via pursuing a circumscribed local agenda for a period in the early 2000s (Riaz, 2016: 2). 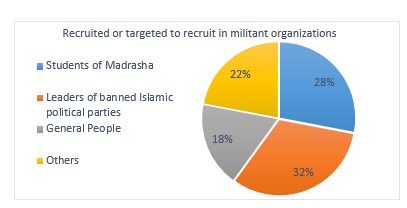 This section was little bit critical for the respondents due to the similarity of the violence of militants with the Islamic political parties along with a maximum portion of ideological indifferences. Surprisingly 38 percent students take their position in favor of ‘yes’ which indicates the involvement of the major Islamic parties in the rise and expansion of Islamic militant organizations in Bangladesh. The Jamaat-e-Islami and its affiliates are often found in violent militant activities lonely as well as jointly with the militant organizations like JMB, JMJB, HuJI-B etc. across the country. Here 24 percent students argue in favor of ‘no’ where their stance shows that since the colonial period the religious political parties are involved in the political, social, economic and cultural development of Bangladesh. Rather the rise of militancy is initiated by the West to retain their influence in the LDCs like Bangladesh after the incident of 9/11 as a part of its ‘war on terror’ strategy. Also their stance reveals the indirect connection of the major and alienated Islamic political parties provoking the militant organizations. Also 34 percent participants choose the option ‘not sure’ due to the ambiguity between the violent activities of the Islamic parties and the terrorist activities of the Islamic militant organizations. As the pattern of the attacks and the similarities in terms of ideology and faith are almost same so the responsibilities of the Islamic parties cannot be denied in the rise and expansion of religious militancy in Bangladesh. Only 4 percent regard the ‘others’ as their answers are that most religious political parties are not responsible rather to some extent in specific acts. This sub-section entirely deals with the perception of the students regarding the validity of the confession taking liability of the contemporary killing or attacking through internet by ISIS (Ansarullah Bangla Team) or Al-Qaeda (Al-Qaeda in the Indian Subcontinent- AQIS).However, 10 percent participants perceive this confession of killing or attacking by ISIS or Al-Qaeda as ‘completely true’ arguing that these terrorist organizations mainly target the Muslim majority countries having fragile governance, weak pluralist social fabric, parochial political culture, lack of compromise and conflict resolution mechanism among the major political forces. As these organizations spread their access from the Middle East to South East Asia so Bangladesh is considered a hub of geostrategic land connecting the mentioned two major regions. Indeed, 66 percent respondents think the validity of this confession of the liability as ‘to some extent’ indicating that both ISIS and Al-Qaeda have strong affiliation with the local as well as national level Islamic militant organizations in terms of patronizing, training, skilling, making plans for attack, recruitment and so on. So they are just constructing a pathway by smoothing the global-local ties for establishing a religious militant order including Bangladesh. Surprisingly 20 percent choose the option ‘not true’ which shows their perception in defense of criminal and terrorist activities by the militant organizations rather than implementing the agenda of ISIS or Al-Qaeda. 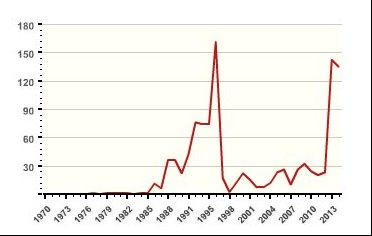 Also the scale and pattern of global jihadist violence largely differs from the militant activities in Bangladesh. Here 4 percent students choose ‘others’ arguing that they do not know anything about the confessions. It is evident that terrorist, militant and extremist activities centering religion are always a matter of concern and pressure within the realm of foreign and diplomatic relations with other countries. 72 percent respondents consider ‘yes’ as their answer indicating that they strongly believe that such kind of militant and terrorist activities would hamper the bilateral as well as multilateral diplomatic and economic relationships with the major allies like India, the USA and other European countries. Already Bangladesh lost the ‘GSP’ in the US market and many of EU business partners revealing the lack of security and certainty due to the violent militant events. As the rise and expansion of militancy in Bangladesh is also a security issue for India more specifically North East India where secessionist movements are going on. For this reason it is often evident the interference of India within the national political arena of Bangladesh. Then 12 percent consider ‘no’ as the answer arguing that as the rapid growth of economy, well reserved foreign currency, shining garments and industrial sectors and many developmental issues are getting importance to the foreign partners. Religious militancy will not hinder the relationship because no of them is out of militancy and terrorism. Also 16 percent choose the answer ‘not sure’ because they feel that globalization of terrorism and militancy endangered the states like Bangladesh who are in stage of ‘pre-takeoff’. As the development partners put conditions regarding militancy but lack of proper evidences create a grey area for them. It appears from the above analyses that the scale of religious militancy in Bangladesh is increasing day by day revealing a close tie with the global militant organizations. Here Islamic militancy is threatening the national security of Bangladesh where the militants play a key role in order to exert their own religious doctrine, ideology and supremacy within the political system. The militants are getting stronger and conducting their violent activities in Bangladesh due to the lack of political integration of the religious forces within the liberal fabric; feeling of alienation of the militants; political, economic, social and cultural suppression over fundamentalists etc. However the recent attacks and killings of bloggers, atheists, university teachers, non-Muslim priests and preachers indicate the presence of militancy in Bangladesh revealing the vulnerabilities of the counter terrorism mechanisms as well as ‘Zero Tolerance’ stance of the government. These violent incidents by the militants also affect negatively the diplomatic as well as economic relations with India, the USA and European countries. In order to uproot the core of Islamic militancy the state should modernize the madrasha system; integrate or assimilate the religious forces within the liberal order; design a technology and strategy based counter terrorism mechanisms etc. In a nutshell, religious militancy in Bangladesh would be a utopia if democratic tradition, norms and values could be institutionalized following a culture of deliberation and compromise.